View a list of names and contact information. L&M Mail & Courier is a locally owned mailing and courier company located in Eau Claire, WI. L&M has grown to serve more than 400 businesses in ten (10) counties on a daily basis. Our growth has been accomplished by providing valuable cost saving services and exceptional customer service. 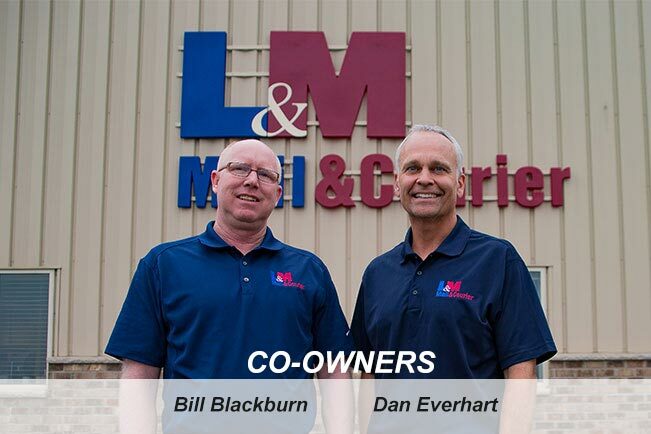 L&M Mail & Courier was incorporated Jan 1, 2001 by co-owners Bill Blackburn and Dan Everhart. L&M is located at 2452 Truax Blvd. in Eau Claire, WI. L&M Mail & Courier is a community-centered organization, offering expertise, volunteer time, and other support to several business community groups throughout the Chippewa Valley. L&M was recognized by the EC Area Chamber of Commerce as the Small Business of the Year in 2008. L&M is a member of the National Association of Presort Mailers.